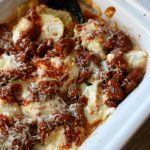 Slow Cooker Zucchini Noodle Lasagna: an easy recipe for a red sauce lasagna with gooey cheese, spicy sausage and sliced zucchini that is used for the noodles all made in your crockpot! Take the zucchini and place in a strainer. Salt the zucchini rounds with a pinch of salt and let sit for about 15-20 minutes. The water from the zucchini will drip out of the strainer so make sure you have a bowl underneath the strainer. Rinse off the zucchini and dry with a towel. You can see how to do this in the video above. In a medium bowl, combine cream cheese, cottage cheese and Parmesan cheese. Use a hand mixer to mix until smooth. In a 6 quart slow cooker or casserole crock layer half of the zucchini in the bottom. Combine the browned sausage and pasta sauce together. Spread half of the pasta sauce on top and half of the cheese mixture. Then repeat the layers (the rest of the zucchini, pasta sauce and cheese mixture). If desired sprinkle with additional Parmesan cheese. Cover and cook on HIGH for 2-3 hours or on LOW for 4-6 hours.